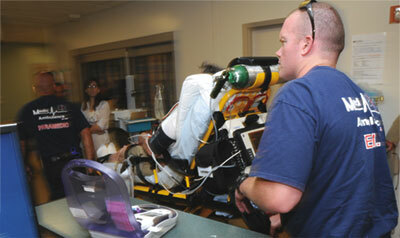 Emergency Medical Service personnel rush a patient in to the NorthBay Medical Center Emergency Department. In emergency medicine, the “golden hour” refers to the first 60 minutes after a trauma has occurred. It is widely believed that a victim’s chance of survival is greatest if he or she receives emergency care within the first hour. The golden hour was first described by R. Adams Cowley, M.D., at the University of Maryland Medical Center in Baltimore. Dr. Cowley’s personal experiences and observations in post-World War II Europe, and then in Baltimore in the 1960s helped him recognize that the sooner trauma patients reached definitive care—particularly if they arrived within 60 minutes of being injured—the better their chance of survival. The concept of the golden hour comes from U.S. military experience. MASH units and medevac helicopters in the Vietnam War contributed to increasing survival rates. Improvements in medications, techniques and instruments were key to survival, but none of these were of any value if the patient remained separated from the surgeon.